The MX54 is a 54" Gas Mono designed for surface drive (optional) and Zenoah G26 or larger. With authentic lines and styling, this hull performs! Radared at 47 mph in a stock configuration with clutch!! Plenty of open area inside the hull to accomodate a clutch (optional) and water pump (optional but required for a clutch). 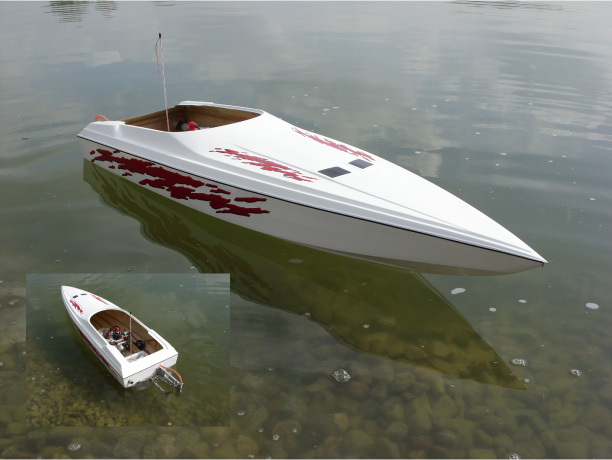 Fiberglass radio box kits are available, as are Mach Enterprises stainless steel trim tabs. Billet aluminum hardware is also available. Rear hatch is included although not shown. Optional rear scoop available, not shown.